I'm not big into celebrating my birthday. I hate the spotlight, and I generally stay home on my birthday, avoiding everyone. My preference is to cook a nice meal and stay in. What does Emil do this year? 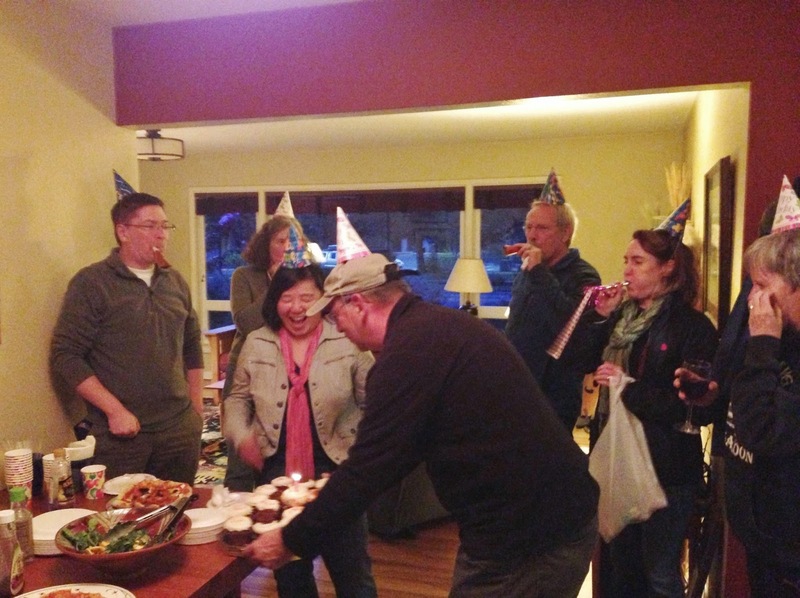 He takes a risk and throws me a surprise party. Side note: I don't like surprises either. It was a lovely evening, and I enjoyed myself! 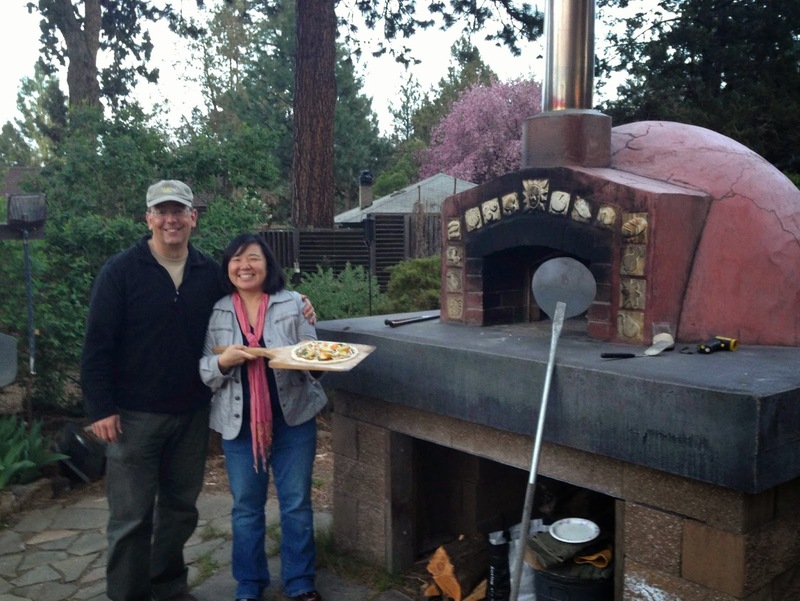 Our friend, Steve, has an outdoor pizza oven. We've gone to his house in the past for pizza parties, and it's so much fun. So, Emil coordinated the party over at Steve's house. Throw in beer, kombucha, dear friends, and delicious pizza. Oh! The day before my birthday, Emil and I went to Portland and spent the day. What a wonderful time! We had the best breakfast at Tin Shed. Dessert pizza! Fresh raspberries and chocolate drizzle. 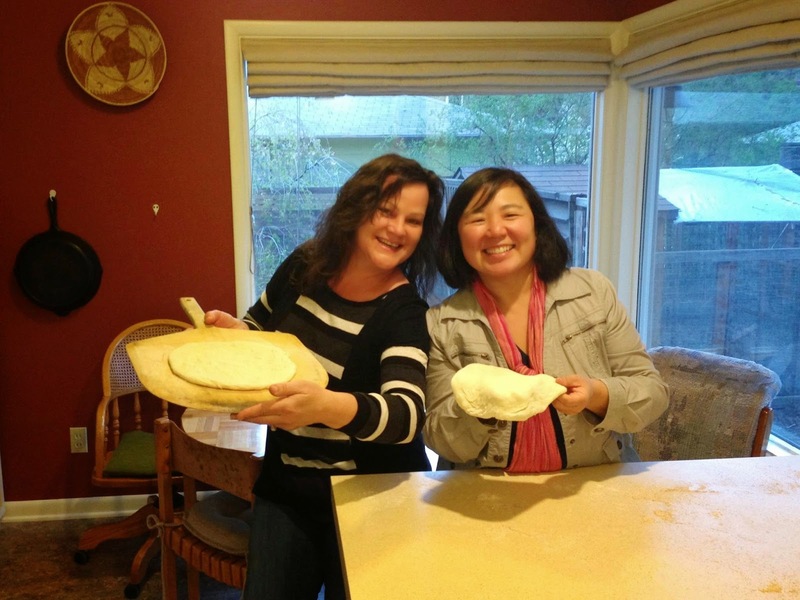 Wanda and I working on our pizzas. Can you tell I've been non-stop busy since December? Sigh. Life has been hectic since then. I could tell you what's been going on, but you wouldn't believe it. More importantly, I've survived. Everyone survived. And, I'm looking forward to a little time off this summer. There are so many things I want to do. Can you believe we've never been to Crater Lake? Yet, my parents have been there twice. I accused my dad of just taking a picture of a postcard and sending it to me. It can't really be that beautiful, can it? Guess we'll find out this summer. There are festivals to attend, parades to watch, hikes, floating the river, and more. I'll finish working at Mt. Bachelor at the end of May. A brief break, then I start up again there in September. Catering has started, and I just finished my second gig. Yep, carpel tunnel and tendonitis are still present. Sigh. I would give it up, but I love cooking and food way too much. Annie's pork chili verde knocked me off the vegetarian wagon. It's THAT GOOD. Let's see ... what else? Lent is over. I dived into a box of donuts and a bag of chips all at breakfast on Easter. Do you doubt me? See pic below for proof. Peeps on top of donuts. So CUTE!! Amazing donuts at Sweetheart Donuts. Fantastic owners! Emil is absolutely buried in woodworking and website projects. If I'm lucky, I see him creep to the kitchen for a bowl of salted caramel gelato for sustenance. Guess Yam and I better start packing for a trip to Crater Lake. Hope he can keep up with me! Gotta get off that winter weight! He's excited to go. See pic below for proof. I'll try to update more often! Thanks for not giving up on me! For Emil's birthday in September, I bought him tickets to see The Ukulele Orchestra of Great Britain. The closest location to see them was Arcata, CA, so I've been saving money ever since to fund our quick trip there. The concert was this past Wednesday evening at Humboldt State University. What a fantastic concert and two day vacation (18 hours in the car). Pizza in Medford. The place is just like the one in Alaska. Our friends, Marlys and Dale, came to the concert as well. We gushed about the music, warm weather, and more during intermission. So glad we were able to go. Finances are tight, so we are being quite frugal. It gave us something to look forward to all these months! I've been slammed with fun, work, and time with friends. How about y'all? 'Tis the season, so I was ready. My Christmas shopping was done fairly early in November. I only had to pick up a few gifts in December. Every year, I have one gift I'm super excited to give someone in my family. This year, I bought my brother, Ted, the perfect t-shirt. It was a tree, shaped like a guitar head. It also said Bend, Oregon on it. He loved visiting Bend this summer, so I knew he would like the shirt. Our tradition is spending Christmas Eve with neighbors and catching up with them, laughing, and eating delicious food. The food theme this year was Mexican, and the neighbors asked me to bring flan. I've never made flan before. Both turned out fairly well ... traditional creme caramel and coconut. We worked on Christmas, but enjoyed a special meal once we got home and cleaned up. Fried rice and potstickers. One of our favorite meals. Way better than take-out! Plus, we were blessed with many wonderful gifts from my family and our friends. Now it's time to think about resolutions and goals. I generally don't make resolutions, but my friend, Tom, keeps nudging me to do it. My first goal is to learn picking on the ukulele. A few uke friends and I are working on this song right now. I'll work on some other goals and keep you posted. Happy New Year!! Hooray! 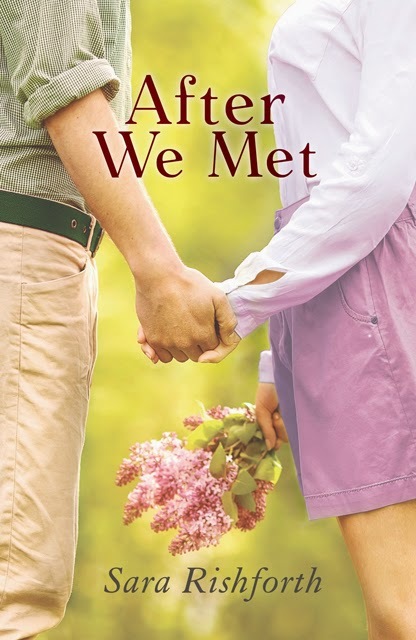 After We Met is the sequel to Adventures in Dating, and it's available for sale. The publishing process was a little easier this time around, and I'm thankful for my friends and family for their support. I had different beta readers this time, and they gave great feedback, especially my mother. She didn't hold back. I did change a few items she mentioned. We also laughed a lot regarding my inexperience with babies and delivery. I teased Emil and said if I write a third book, the main character is getting a divorce and moving back to Charleston. I'm not into always writing a happy ending. My books are nothing like my real life, right? There's also a Kindle version available on Amazon. I'll schedule a book signing in January once I have books in hand and a clear mind. If you like my book, please consider telling a friend about it. That's the highest compliment for a writer!